The award presentation ceremony of the photo competition in celebration of the 20th anniversary of the establishment of the HKSAR held on 15 July 2017 at Tang2 Restaurant of Cheung Sha Wan Plaza. Por Yen Charitable Foundation was the major sponsor for the ceremony. It was an honoured to have invited the two renowned judges Mr. Vicent Cheng (不動明王) and Mr. Gilbert Yu and Mr. Andrew Wells, the Executive Director and Deputy CEO of Por Yen Charitable Foundation as the guest of honour. 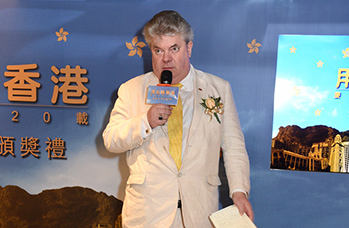 Mr. Andrew Wells, Executive Director and Deputy CEO of Por Yen Charitable Foundation at the award ceremony of the photo competition to celebrate the 20th anniversary of the establishment of the HKSAR on 15 July 2017.